The Plasto by Vapor Hookahs is a 29" tall modern hookah manufactured in China to ensure a consistent design with every purchase. 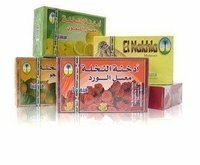 The Plasto shisha pipe comes as a complete hookah set including all the necessary grommets and instructions as well as hookah tongs and an unglazed Egyptian clay bowl; great for ghosting a single flavor profile. 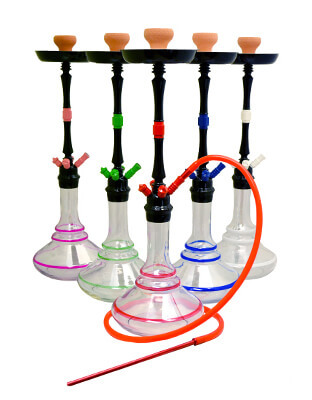 Plasto hookah pipes are single hose hookahs with multi hose capability that may be converted into a 2 hose, 3 hose, or 4 Hose model with the appropriate Extra Large hose stem adapters. It has a large clear glass vase with minimalistic single colored stripe designs. The vase shape is fat on the bottom and tapers up into a slim neck connecting to the threaded common chambered heart. Inside the colored hose ports there are Pyrex glass ball bearings that will not rust over time and the down stem provided is a very wide gauge for optimal performance and an open draw. The tray is aluminum being silver on the inside and black on the outside with raised walls and screws on tight for a secure fit. The stem is slim and solid black with a squared color segment in the middle. All pieces of the stem are segmented and can be taken apart and screwed together to form a much smaller version for maximum portability. Finally, bringing the whole package together, it comes with a silicone hose that has a colored aluminum handle that is completely washable and designed to match the whole setup. 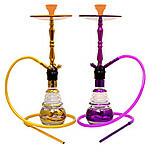 This narguile is available in various colors to ensure a perfect fit for everyone?s tastes and, with proper cleaning and maintenance, will provide entertainment for years to come.